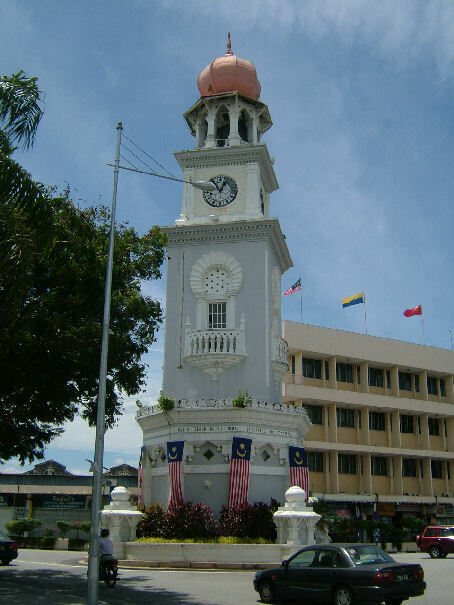 The Queen Victoria Diamond Jubilee Clock tower, in Georgetown in Penang is a Moorish-style Clock tower. 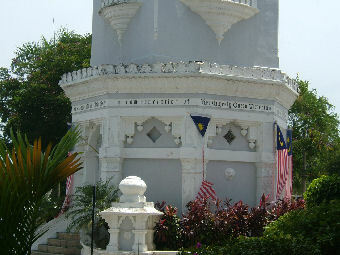 It's located in the middle of the roundabout at corner Fort Cornwallis outside Swettenham Pier of Lebuh Light and Lebuh Beach. Used to chime correctly but I think the clock is no longer accurate timed. It's sixty feet tall, one foot for each year of Victoria's reign. A corner of the wall surrounding Fort Cornwallis appears behind the tower, which was built to commemorate Queen Victoria's 1897 Jubilee. The Clock tower is in Georgetown just near the ferry terminal of the Swettenham Peer. Also very close by is the Esplanade (the City Hall) and Fort Cornwallis. Don't forget to visit the old British fort (made by Sir Francis Light), when you go to the Clock tower. Be careful by crossing the street, because there's a lot of traffic at the roundabout with the Clock tower in the middle. Next to the Esplanade is a popular waterfront promenade which stretches from the hawker stalls at one end to the clock tower at the other. This Victoria Memorial Clock Tower was donated by Cheah Chen Eok in 1897. 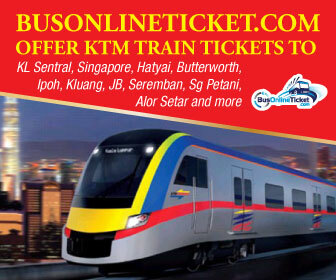 This man was a wealthy Penang citizen. 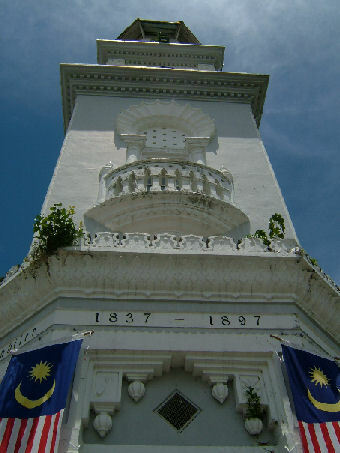 Cheah Chen Eok in 1897 presented the colck tower to commemorate the Diamond Jubilee of Queen Victoria. The 60ft-high (18.3m) clock tower--symbolising 60 years of the Queen's reign--was only completed in 1902 when she had passed away. The clock tower was finally completed in 1920. The tower cost 35,000 Straits Dollars to build. During World War II, bombs dropped on King Edward Place and caused the clock tower to tilt slightly. Location: The roundabout at the end of Pesara Raja Edward.